EWP, JACCC team up for Los Angeles premiere of Broadway musical. East West Players and Japanese American Cultural & Community Center announced that stage, television, and film star George Takei will lead the cast in the Los Angeles premiere of the Broadway musical “Allegiance,” which will be co-produced by EWP and JACCC by special arrangement with Sing Out, Louise! Productions and ATA, with performances at JACCC’s Aratani Theatre in Los Angeles from Feb. 21 to April 1, 2018. Previews will run from Feb. 21-25, with the Opening Night performance and reception on Feb. 28. 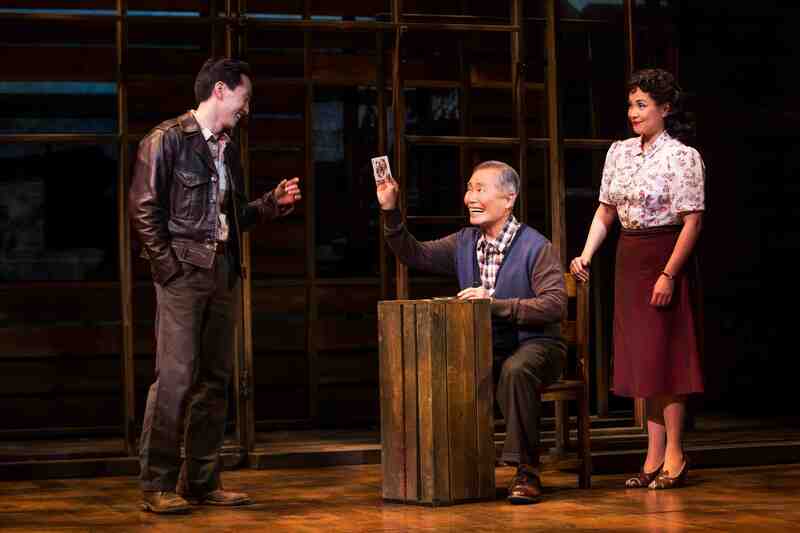 With music and lyrics by Jay Kuo and a book by Kuo, Marc Acito, and Lorenzo Thione, “Allegiance” tells the story of the Kimura family, whose lives are upended when they and 120,000 other Japanese Americans are forced to leave their homes following the events of Pearl Harbor. Sam Kimura seeks to prove his patriotism by fighting for his country in the war, but his sister, Kei, fiercely protests the government’s treatment of her people. An uplifting testament to the power of the human spirit, “Allegiance” follows the Kimuras as they fight between duty and defiance, custom and change, family bonds and forbidden loves. “Allegiance” had its 2012 world premiere in a record-breaking engagement at the Old Globe Theatre in San Diego and played on Broadway from 2015-16 at The Shubert Organization’s Longacre Theatre. “It is such an honor to be able to bring ‘Allegiance’ to my hometown of Los Angeles and specifically to Little Tokyo,” says Takei. “I’m thrilled by this opportunity to reprise the roles of Sam Kimura and Ojii-Chan, which heralded my Broadway debut. The musical is inspired by Takei’s true-life experience. From age 5 to 9. he was unjustly imprisoned in two different camps (Rohwer in Arkansas and Tule Lake in California) during World War II. With a career spanning six decades, Takei is known around the world for his founding role in the acclaimed television series “Star Trek,” in which he played Hikaru Sulu, helmsman of the starship Enterprise. But Takei’s story goes where few stories have gone before. From a childhood spent in camp to becoming one of the country’s leading figures in the fight for social justice, LGBTQ rights, and marriage equality, Takei remains a powerful voice on issues ranging from politics to pop culture. Following “Allegiance,” Takei returned to the New York stage this year, starring in a revival of Stephen Sondheim’s “Pacific Overtures,” directed by John Doyle at Classic Stage Company. Mashable.com named Takei the No. 1 most-influential person on Facebook, currently with nearly 10.3 million likes and 2.3 million followers on Twitter. Takei lives in Los Angeles with his husband Brad Takei.